Mother's Day is coming up - how will you celebrate? This year, I have a special Mother's Day for the simple fact that my son, Joel, was born on the same date six years ago. It really gives me all the feels because his existence is why I can even celebrate Mother's Day to begin with! But even though his birthday falls on Mother's Day, he'll still have a little birthday celebration mixed in with honoring moms and grandmothers. It seems like a popular way to celebrate Mother's Day is a brunch, either out at a special place or made lovingly at home (which I prefer!). 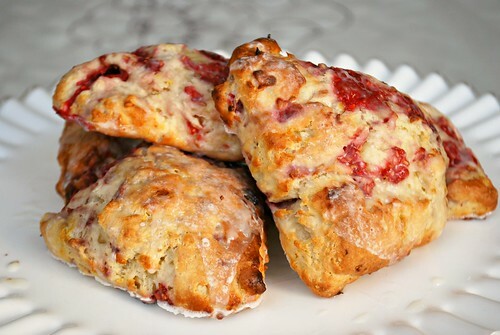 If you're looking for a sweet brunch idea, these Fresh Raspberry Cream Scones will hit the spot. 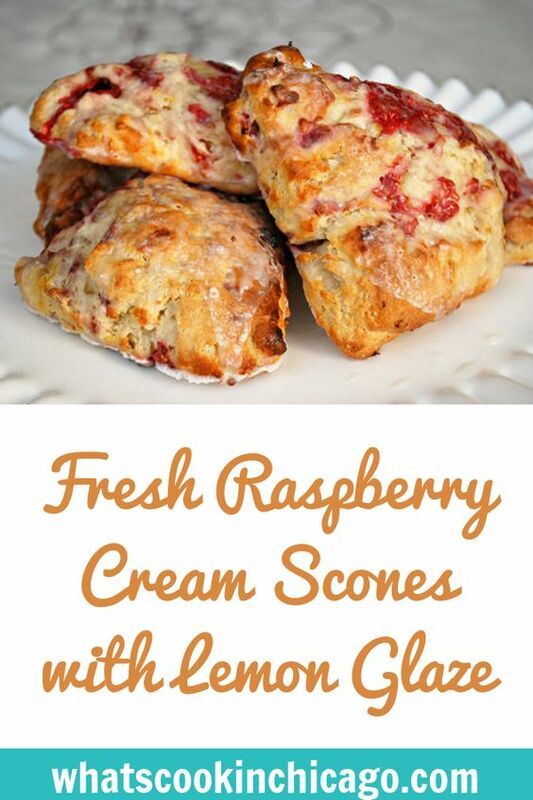 Studded with fresh raspberries in a rich cream dough and drizzled with a lemon glaze, it's perfect for Mother's Day, a spring brunch or just a sweet treat anytime! This is a great scone base recipe that you can even substitute with 6oz of other fruit such as blueberries, chopped strawberries or blackberries. All would work nicely with the lemon glaze too. They keep well, thanks to the heavy cream that makes a soft and tender crumb. We like these with a cup of coffee and slightly warm for a delicious brunch treat! In a bowl, sift together the dry ingredients - flour, baking powder, sugar and salt. With 2 forks or a pastry blender, cut in the butter until coated with flour until it look resembles coarse crumbs. Dust your working surface with flour and transfer the dough onto the floured surface, forming the dough into an 8 inch disk. Flatten the dough slightly and cut into 8 wedges, like a pie. Place each wedge onto the prepared cookie sheet about an inch apart and brush the tops with heavy cream. Bake in the preheated oven for 16-18 minutes or until scones begin to turn golden brown on the edges. Remove from oven and allow to cool on a wired rack. As the scones cool, prepare the lemon glaze. In a microwave safe bowl, combine the lemon juice and confectioners sugar until dissolved. Add the butter and heat in the microwave for 30 seconds. Remove and stir in the fresh lemon zest. Continue to whisk until smooth and lump free. Drizzle over cooled scones and serve.